I have been using Google Reader (www.google.com/reader) to follow all the blogs I am interested in for quite a while now (and highly recommend it). You will need a Google account, but if you use GMail (or any of their other services) then you already have an account. 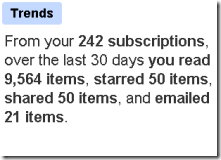 One of the features I have never really used much is the “Trends” section of Google Reader which is really quite cool. It keeps statistics on your last 30 days of blog reading and gives you some helpful information about what you have been up to. 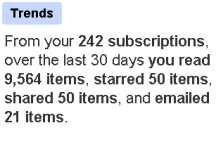 So, for example, I now know that I have 242 subscriptions, from which I “read” 9,564 items. I put “read” in quotes because I really just skim 90%+ of the articles, looking for interesting headlines or images in the posts. The nice thing about Google Reader in this regard is that it gives you really helpful keyboard shortcuts. So I can put the reader in “full screen” (F11) mode, pick my category, hit “u” to remove the navigation. And go through the entire “channel” using the “j” and “k” keys to jump from one article to the next. When one is interesting I can read it in full or “star” if for later. Just like GMail, Reader allows you to add a star to any post. This is like bookmarking the post for later reading or research. Google Reader also lets me “share” any posts which creates a custom page (http://www.google.com/reader/shared/10475243398710149798 ) and feed of the stuff I found interesting enough to read (and perhaps follow up on). If I think it is interesting to someone else, I can even e-mail it right from the reader to that person. So, out of the 9,564 items in the last 30 days, 50 were interesting enough to share, 21 were interesting enough to e-mail, and only 3-4 were interesting enough for me to really blog about. One other cool thing I found in the Trends were graphs of my activity. So it looks like my “information consumption” occurs primarily between 6:00 and 7:00 in the morning and between 8:00 and 10:00 at night. It also looks like Wednesday gets about 1/2 as much attention as other days and Sunday is only about 1/5 of the time. It would be interesting to set goals and limits based on this data and even “weed out” some underperforming feeds based on how much value I seem to get out of them. I’ll try to post a list of what I find to be the most interesting blogs of the bunch.